JungleBell can dynamically generate alert content using information from other SharePoint lists. In this tutorial you will learn how to create dynamic alerts. To start creating dynamic alerts you will need to navigate to the content configuration tab. Let's get started! 1. To access the dynamic section (Repeater) run JungleBell and navigate to Alert Content. Select a table or put the cursor where you need the repeater to be and click the button Repeater. 2. By clicking it you will access the configuration window. 3. After you have configured the repeater according to your needs, save the settings, the repeater will be present in your email body. Content list – a list which contains data than you need to include in your alert body. Filter content by view – a specific view in that list. Number of items to display – you can set a limit to returned items. Additional conditions – rules that determine what data is retrieved. You can add conditions after you select the source list. 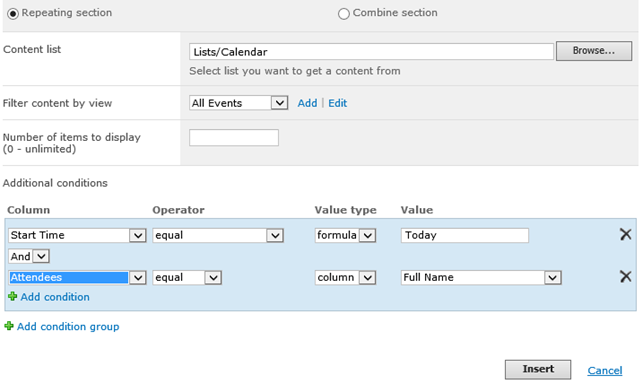 Formula – a combination of SharePoint columns and text. Formulas are given as text or columns. Column names are given directly, text must be given inside “quotation” marks. You can join text and columns to receive a longer string. Use & for that. For example if you want to join title “Mr” and name column, it would look like this: “Mr “ & First Name. Note the space before quotations. You can also add (+) or substract (-) to columns that hold numbers, for example: Today + 30. 4. Enter the value. In the following example we set up conditions for our licenses list. First condition checks if licenses are active. Second condition checks if company name is matching, with the one that is given in the recipient list. Third one checks if their expiration date is in the future. 5. Once this is finished we can insert a repeater. We must insert columns from the source list. Do this by clicking “Columns”. Note: If no repeater is present, JungleBell will only allow you to use columns from the watched list. In order to access columns from other lists, we must add a repeater and put the text cursor in it. Now you will be able to use columns from that list.